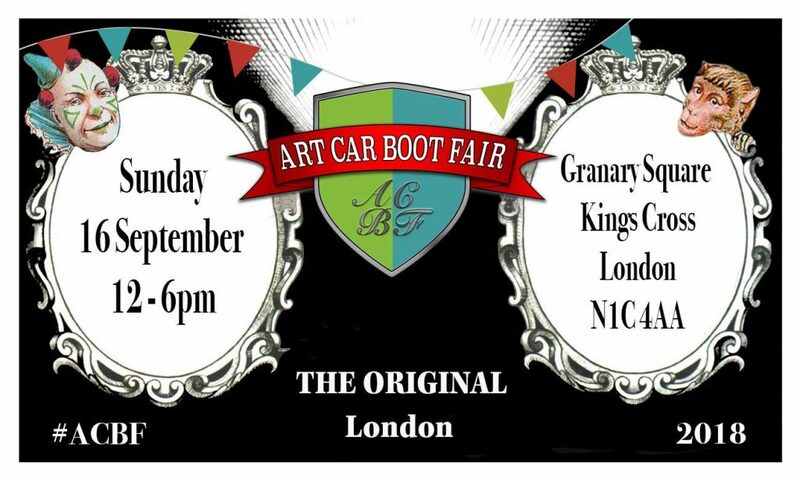 Black Door are proud to announce our partnership with the fabulous Art Car Boot Fair on the 16th September 2018. From humble beginnings in Brick Lane in 2004, the Art Car Boot Fair has come a long way and will this year pitch up in the regenerated Granary Square in the heart of London’s Kings Cross. Their concept is very simple : to sell art at affordable prices. But this isn’t just any old art. Turner Prize nominated artists such as Tracey Emin & legendary “pop” artist Sir Peter Blake have set up stall or flogged their wares out of the back of a car in previous years and this year’s list of artists is as equally impressive. Regulars Sir Peter Blake & Gavin Turk are joined by Geraldine Swayne, Polly Morgan, Matt Collishaw & Rachel Howard to name but a few and Black Door’s very own Andrew Weatherall & Justin Robertson will be pitching up to sell their artwork and a very special one off pieces created for the event. Black Door DJs will provide the entertainment for the whole day – doing what we do best and creating the perfect musical backdrop for arts event. DJ sets from Justin Robertson and Andrew Weatherall will be followed by The Kevin Rowland DJ Show and a disco knees up with The Guardian’s Miranda Sawyer and her DJ cohort Lulu Levan will finish off the day.